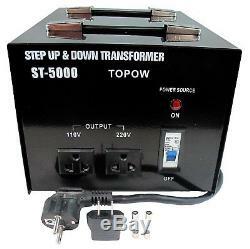 TOPOW ST 5000 - Step Up Or Step Down Voltage Converter Transformer. 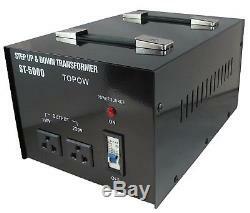 5000 Watt Maximum Capacity Heavy Duty Voltage Converter / Transformer. 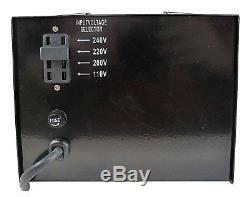 Input Voltage: 110/120/220/240 Volts /AC Selectable. 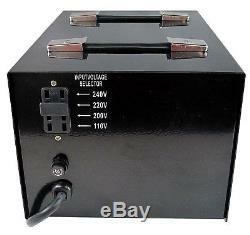 OutputVoltage: 110 Voltsor 220 Volts / AC Selectable. Simultaneous 2-Mode Output 120 Volt (Standard US Outlet) / 220 Volt (Universal Outlet). All Range Fuse Protection With Two Spare Fuses Included. CE / ISO9001 / ISO14001 Factory Certified. Measurements - 8 1/4" x7"x 12 1/2 Inches (Wx Lx H). Power CordLength - 32 Inches. 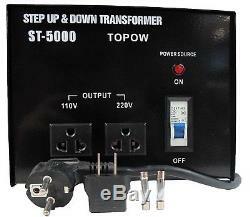 Made by one of the leading manufacturers in the industry, the Topow ST Series step up / step down voltage transformers offer you a safe, reliable, affordable and convenient solution to converting voltages from 110-120 volts up to 220-240 volts, or from 220-240 volts, down to 110-120 volts for both home use and industrial applications. 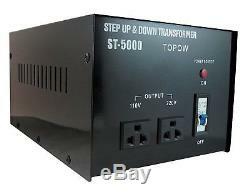 The ST-5000 is rated at 5000 watts maximum. It features a heavy-duty cord with a standard round prong plug, plus a free American Flat outlet plug adapter. There are a total of two outputs on the front panel. Two are grounded outputs, one designated for 110 volts with a US standard outlet, the other for 220 volts only with a universal outlet. Also uses a protective standard fuse for extra safety. 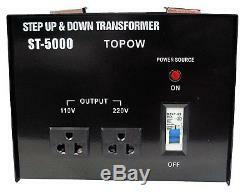 Remember to leave at least a 100% slack for the transformer. 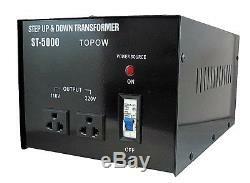 Using them to maximum capacity will eventually burn the transformer out after prolonged use. Some items, such as laser printers and power tools spike when you turn them on. Volts (times) Amps = Watts For example 110 VoltsX 5 Amps = 550 Watts. 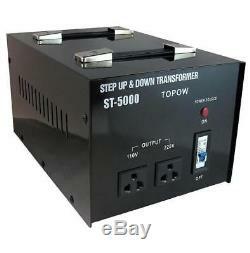 The item "5000W Watt Step Up Down Electric Power Voltage Converter Transformer Heavy Duty" is in sale since Saturday, August 1, 2015. 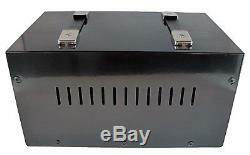 This item is in the category "Consumer Electronics\Multipurpose Batteries & Power\Travel Adapters & Converters". The seller is "portugaliasales" and is located in Newark, New Jersey.